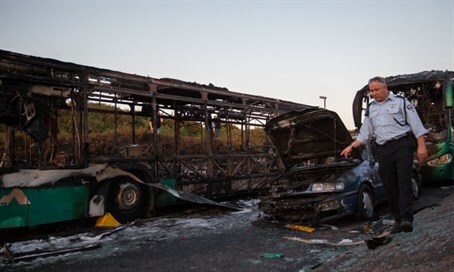 ISA reveals it arrested several Hamas terrorists thought to have helped plan and conduct Jerusalem bus bombing on Monday. The Israeli Security Agency (ISA) on Thursday released for publication that it has arrested several Hamas terrorists from Bethlehem in Judea who were involved in the bus bombing in Jerusalem on Monday. In the attack Abd al-Hamid Abu Srour, a 19-year-old from a well-to-do family in Beit Jala in the Bethlehem area detonated a bomb on a number 12 bus in southeastern Jerusalem, wounding 15 passengers including two who were seriously wounded. The terrorist was also caught in the blast, and died of his wounds on Wednesday night. Abu Srour was a member of Hamas, and the terrorist organization took responsibility for the attack. ISA revealed on Thursday that around a day after the attack it arrested several Hamas terrorists from the Bethlehem region who were involved in the bombing. It is suspected that the terrorists took part in planning and materializing the bombing attack. The terrorists were transferred to ISA interrogation. The attack took place on Moshe Baram Street and Derekh Hevron, located in southeastern Jerusalem near Kibbutz Ramat Rachel. While Abu Srour had no identification on him, the explosive device had been placed on the bus floor between his feet, suggesting that he was in fact the bomber, and that the device had exploded prematurely. Arab media sources claimed on Thursday that Abu Srour’s father had been taken into custody by Israeli security forces in order to conduct a DNA test to verify the man’s identity.